The Revcontent API enables you to receive the same ad fill you would see in our traditional ad placements in a more flexible format, json or XML. API usage requires Full Advertising Disclosure. 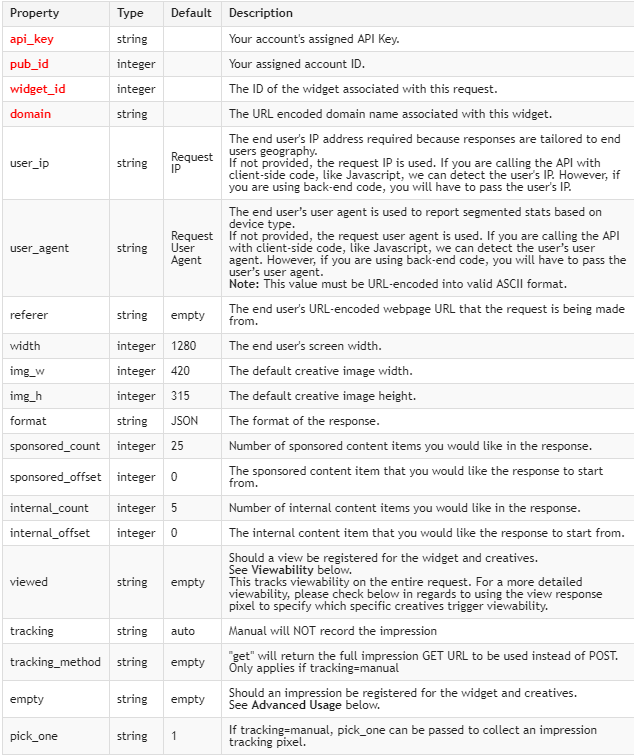 API requests can be in either JSON or XML format. The expected response values in the return payload are shown below. Views must be tracked. A view occurs when a widget or new creative comes into the users viewport. For more advanced implementations widget and creative impressions must be managed. The API provides helper parameters for common use cases. The empty parameter allows a request to be made without registering either widget or creative impressions. Pass empty=true to return a response without registering any impressions. Default is auto. If manual is passed, it will NOT record this impression until the impression data is posted back to /v2/track.php passing in field name of “d”. Viewed can be triggered in the passback as well. Passed in a POST or a GET. viewed=1 or do not send viewed at all. When calling the API using a GET call with tracking parameter set to manual (tracking=manual), you are also able to pass a parameter (pick_one=1). If pick_one is set, content will get a new property attached referred to as “impression”. Users are able to use this as an impression tracking pixel when calling the track..php call. This enables a user to trigger an impression on a certain piece of content. Each content and subsequent click link would be position =1.